Overnight a water pipe in a commercial Macungie building broke due to the freezing temperature. Since the water pipe was located in the attic of this two-story building the water flooded the entirety of the building. It soaked the walls the ceilings and the floors. When the first people arrived at the building for work they realized just how much damage was done. 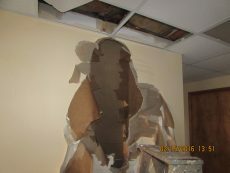 The Allstate tenants in one of the offices contacted us to clean up the damage. We arrived at the building in just 15 minutes. Cityline was hired for our emergency services and to conduct restoration work on the building. When we arrived to the property we assessed the damage done and the extent of repair work that would be needed. Our initial observations were that most of the ceilings would have to be replaced and the carpeting excavated. We would also have to remove the drywall and strip it down to the studs. Since the power to the building was knocked out it was important for us to bring our own generators. Because there were still parts of the building that were salvageable we had to start work quickly. Our demolition and cleaning crews arrived immediately with our drying tools to mitigate the water damage. We started to remove the puddles of water and to strip away the drywall when the water had coagulated. This is where the fun began. 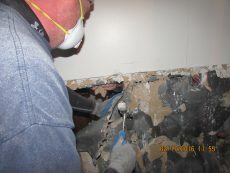 As we started to strip away the wall we realized that in most rooms the drywall was 3 layers thick. 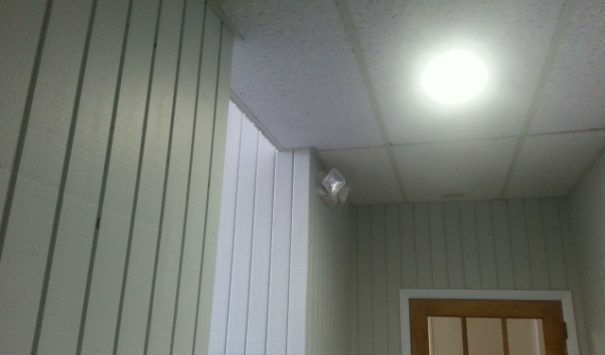 This is because the property had switched hands multiple times and rather than replace the drywall, tenants would just put up a new layer of drywall instead. This made things more interesting, but it was no problem for our team of trained professionals. 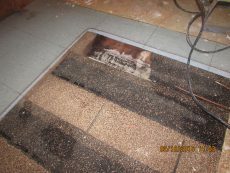 After we removed the carpeting we found that the floor as well had multiple layers to it as well. We went through and removed all the excess layers we found in the building to make sure there was no hidden water sitting stagnant in the property. After we finished removing the damaged drywall we started cleaning the air of toxins and mildew. With the help of our HEPA vacuums we were able to remove these hazardous elements from the walls and the rest of the building. 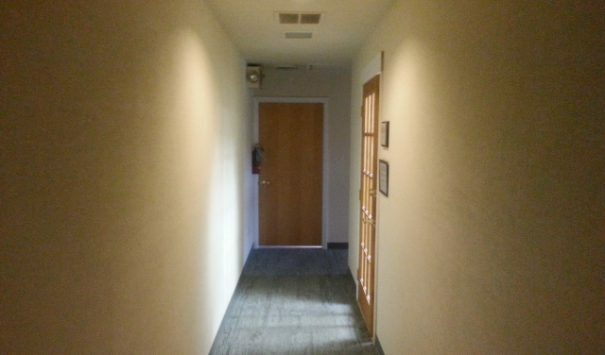 Since the building was built for residential use and was not updated when it switched over to commercial use, it was not up to commercial Law and Ordinance code. 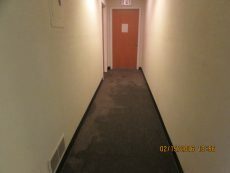 This implied that we were not able to start reconstruction until we updated the HVAC, electrical, plumbing and the insulation in the entire building, not just where the damage occurred. To do this we brought in our in-house crews and continued to work on re-doing just about every aspect of each of the above. We worked with the property owner to better wire the home so that it was in the best possible pace to be beneficial to future tenants. While working on the plumbing, electrical and insulation, we worked with the state inspectors to make sure that the building was up to code. Once we received approval from the state we started the reconstruction process. We replaced the drywalls that we had removed and added the floor with one layer this time. 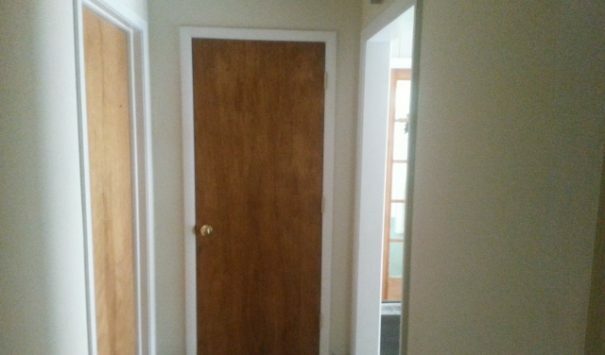 We worked with the property owner in choosing the carpeting and the paint selection for the rebuild and put those in at the appropriate time. When we finished rebuilding the place we moved all the offices back in so they could start working again. 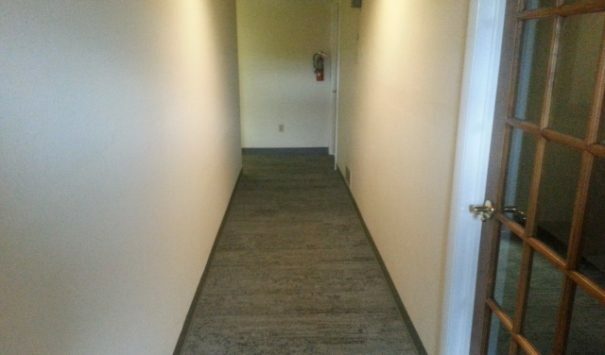 The tenants were very happy with the work we accomplished did and enjoyed the new carpeting. 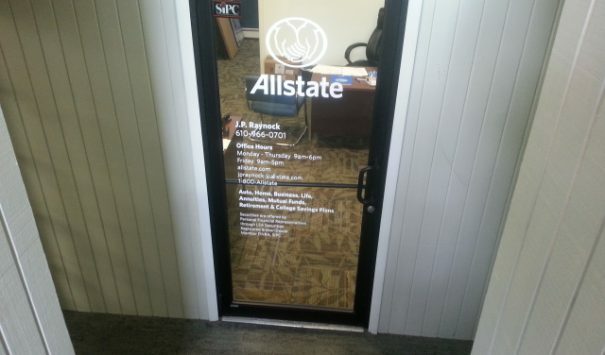 During the entire process, Allstate insurance knew their building was in good hands.